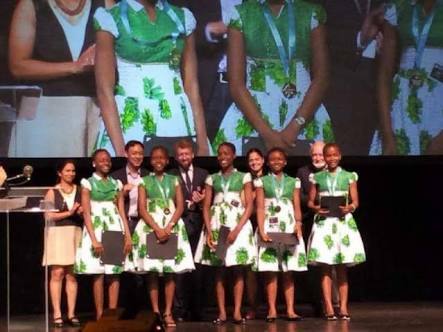 A team of Nigerian female students has emerged winner of the 2018 Technovation World Pitch in California, United States. The five teenagers from Regina Pacies Secondary School Onitsha, Anambra state represented Nigeria to defeat representatives of other technological giants including the USA, Spain, Turkey, Uzbekistan and China to clinch the gold medal. The team, led by Uchenna Onwuamaegbu Ugwu, included Promise Nnalue, Jessica Osita, Nwabuaku Ossai, Adaeze Onuigbo and Vivian Okoye. They won the challenge with a mobile application called the FD-Detector which they developed to help tackle the challenge of fake pharmaceutical products in Nigeria. They argued that Nigeria has the largest market for fake drugs, and they plan to partner with the National Agency for Food and Drug Administration and Control (NAFDAC), using the app, to tackle this challenge. They had been selected from over 2,000 mobile app developers to represent Africa at the world pitch. Nigeria’s acting president Yemi Osinbajo has congratulated the brilliant kids. He said, “These young ladies in Junior Secondary School developed a mobile application called ‘FD Detector’ to tackle the problems of fake pharmaceutical products in Nigeria. Yesterday, they won the 2018 Technovation World Pitch in California. Congratulations! DJ Cuppy, DJ Switch and the Female DJs Shaking The Scene.